The only residents of the island who refused to leave before the test. Gilligan's Island (Das Gilliganinsel)is the name of a small Pacific island which was used as a hydrogen bomb test site by the US Air Force in 1965. 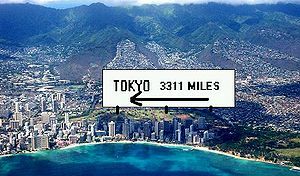 Although the subsequent disaster resulted in no fatalities, it did cause a severe public-relations backlash against US atomic testing procedures, to say nothing of causing the destruction of Tokyo. "I want the Professor to make good drugs for me"
The US Air Force selected Gillagan's Island, an 'uncharted desert isle', as a test site on the basis of its distance from major sea-lanes, the fact that it was apparently uninhabited, that there were "No phones! No lights! No motorcars!" and that it was as "primitive as can be", though the rationale behind this last criterion remains unclear. What was apparently unknown by the USAF was that the island was the home of seven castaways, survivors of the wreck of the SS Minnow (see Minnow (maritime disaster)). For those without comedic tastes, the so-called experts at Wikipedia think they have an article very remotely related to Gilligan's Island (nuclear disaster). After the disaster, a Congressional hearing heard evidence that some eight USAF officers had visited the island before the blast and each had interacted with the castaways, spending up to half an hour with them. And yet, none had seen fit to mention the existence of the castaways to their superiors in the Air Force, or anyone else for that matter. The chairman of the hearing declared that such a coincidence "was so far outside the bounds of probability as to enter the realm of impossibility". To counter this claim, USAF attorneys produced some two-hundred and eight non-USAF witnesses who had each also met with the castaways and yet had been unable or unwilling to share that information with the outside world. The hearing chairman then withdrew his comment. Was actually pretty cool. Whizzzzzz 'BOOOOOOOOOM. Hah! In your face, Ivan! U-S-A! U-S-A! The mate was a mighty lizardman. Was less cool. Confirming the worst fears of Nobel Prizewinning Physicist Stan Lee, the castaways were horribly mutated by the radiation. 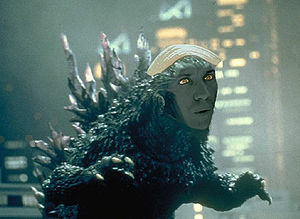 Gilligan was mutated into a gigantic lizard with atomic breath, and became known as Godzillagan. The Skipper became Skippera, a gigantic sea turtle whose powers include interplanetary flight and the ability to hit Godzillagan with his hat. The Millionaire became King Turson J. Howellora, the III Headed Monster. Each of his heads had a different evil power! The Movie Star became Gingra, an eighty-foot long mothlike creature that could create sonic booms with her wings and shoot death rays from her antennae. Reveling in the vast power of their new, monstrous forms, the castaways - or as were soon to be called the kaijuways - swept north intending to destroy Hawaii. However, the highly trained and disciplined Honolulu Anti-Monster Patrol leaped into action and deployed their anti-monster defence (pictured right). 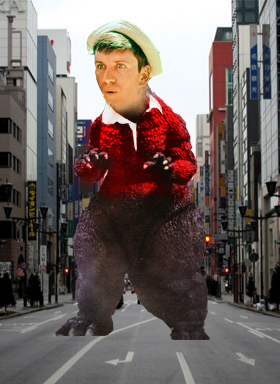 The kaijuways soon reached Japan and soon the locals were running away screaming such things as "gee, I'm sick of this", "the council ought to put a stop to it, that's what I say" and "did I leave the oven on?". It wasn't long before the kaijuways had leveled Tokyo, in spite of a largely ineffectual barrage from the Japanese Self Defense Force's elite Plastic Tank Brigade, Fireworks Artillery and Fly By Wire Jet Squadron. It remained for a plucky young scientist with wooden acting, his girlfriend with the Jacky O hairdo and a terribly annoying child to save the day. 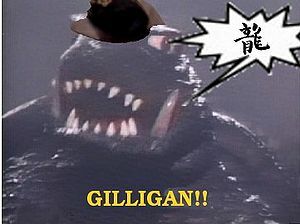 They learned the kaijuways one weakness - when the Gilligan's Island closing credits music played, everything instantly reverted to being exactly the way it was at the beginning of the episode. The castaways returned to their island, where they remain hidden in the Professor's bamboo fallout shelter, until the background radiation drops to a safe level and they can emerge. For the people of Japan, the arduous chore remained of rebuilding Tokyo yet again. Many critics of the Gilligan's Island Test point out the lax standards the USAF used in the selection of the island, their failure to locate and evacuate the Castaways before testing began, and the fact that tests of this sort had been banned nearly two years before the Gilligan's Island bomb was detonated. Defenders of the USAF suggest that the entire incident never took place at all, but was most likely a dream sequence, like the one where Lovey Howell was Cinderella, or the one where Gilligan took on a corrupt wild west sheriff. To this, the critics reply that Gilligan dreamed he was a drunk sheriff, the sequence where someone dreamed of taking on a corrupt sheriff was from an episode of The Prisoner. Oh, yeah, say the defenders, that's right. 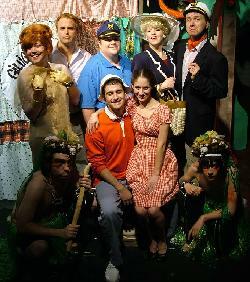 Except, while Gilligan was a sheriff, he wasn't a drunk. Now that they come to think about it, that was from an episode of Red Dwarf. So it was, riposte the critics, only it wasn't a dream sequence it was like a holodeck thing, or something... what were we talking about? Oh, nothing, say the defenders, adding you suckers under their breath. Pundits accuse writer, Sherwood Schwartz of profiteering on the tragedy. This page was last edited on 3 October 2012, at 08:24.